Learn to Speak “ESPN”, Ladies! I have come to the conclusion that in business, talking sports can be a really good idea for women. Before I go any further, let me throw out a few disclaimers here. Rest assured that I am NOT a proponent for women “acting like a man” to get ahead in business. I think women bring their own special gifts to the workplace, and that we can succeed just fine by acting like ourselves. Don’t allow anyone to patronize you or dismiss you in any way. And yes, I understand that there are plenty of men who could care less about sports, and that’s just fine, too. But business is all about relationships, and the best way to build a relationship is to find areas you have in common with the other person. When you’re a woman in the business world, sports is usually a great ice-breaker. I discovered this by accident years ago. I always was a sports fan to a certain degree. I am particularly enamored with NASCAR racing. People are always surprised by that – I refer to myself as a “closet redneck”. I’m watching the race in Pocono as I type this. Seriously. Anyhow…I was sitting in the break room at the large call center where I was a manager about ten years ago, having lunch with some of the male managers there. It was a Monday, and one of the guys mentioned the weekend’s auto race. He said something disparaging about “my” driver’s involvement in an accident, and I jumped in with a detailed rebuttal explaining why it was really some other guy’s fault. Along with the surprised looks of “hey, she knows NASCAR!”, I saw something else in the eyes of these guys who were always polite but never exactly friends. They were looking at me like I suddenly existed. If you’re a working woman, you know what I mean. When I saw them looking at me with that strange expression (“Who is this woman?” “Why didn’t we know she was cool before?”), a light bulb went off. But not all guys love NASCAR, so I decided to experiment. I’d sit with the guys and jump into their conversations about baseball, football, basketball, whatever was the sports du jour. And here’s what I learned then, and since then. 1. Don’t fake it. There may be times when you can fake it with men (get your mind out of the bedroom – I’m talking about the times we refer to our brand new shoes as “what, these old things?”). Sports isn’t one of those times when you can fake it. Don’t say you saw the fantastic play they’re talking about unless you really saw it (even if it was just in highlights). It’s okay to say “Yeah, I heard about that catch – they said it was awesome!”. Don’t gush about what a great game it was just because you saw the score and the home team won. It’s embarrassing to find out that the win came at the cost of the best player being injured, or that they blew a 10-point lead and barely hung on for the win. Yes, it’s a win, but it’s what’s referred to as “an ugly win”. You don’t brag about ugly wins. You breathe sighs of relief that the team pulled it off. Learn the lingo, ladies. 2. Pick a team to cheer for. You’ll look like an idiot if you rave about how much you love baseball, and then, when one of the guys asks you which team you follow, you gush “oh, I love them all!” Only dweebs say that. You’d be much better off saying you don’t follow the sport. It’s always a safe bet to back the hometown team. But don’t say you follow them if you’re not ready to do at least a little homework (learn a few names, watch the local scores, etc.). If you really want to stand out and be bold, then follow a different team than everyone else. But if you’re going to do that, be ready to take the heat and the “trash talk” (that’s sports lingo for someone belittling you and everything you stand for to throw you off your game). And also be ready to step it up – you’d better really know your stuff if you’re going to be a Red Sox fan in Yankee country. Trust me, I know this first-hand. 3. Watch ESPN. Really. You don’t have watch it 24/7. You don’t have to watch entire games. But watch “SportsCenter”. The show runs basically all the time. Not exactly, but it seems that way – they’ve run more than 30,000 episodes. It’s on and off throughout the day (and night). It’s the “CliffNotes” version of the sports world, and you can learn a lot in just one 10 minute segment. If you want to know enough sports to sound authentic, just watch 10 – 20 minutes of “SportsCenter” every morning. The show quickly runs through multiple sports headlines, and shows the best and worst plays of the day/week/whatever in their “Top Ten” and “Not Top Ten” clips. A nice plus is that it’s also pretty entertaining, with some good humor. Watching it won’t kill any brain cells, I promise. 4. Be prepared to surprise yourself. As I’ve mentioned, I never considered myself a true sports fan – other than the stock car thing. Okay – I’ve always loved the beautiful corny poetry of American baseball in general (confession: “Field of Dreams” is my favorite movie ever), but I really didn’t follow specific teams. 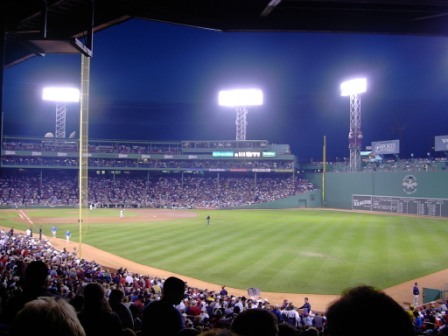 When I met my Boston-raised husband, I was instantly brought into the world of Red Sox baseball, Patriots football, and Celtics basketball (I just can’t get into hockey…). So those became “my teams” when I wanted to talk sports. I don’t live in Boston. I live in New York. So I have taken a fair amount of heat. I had to keep up with the teams to hold my own. And a funny thing happened. I started to really enjoy it! Okay, it helps that all three teams have won at least one championship in the past few years (the best way to shut up the trash talk is to win), but even in the tough years, I’m still having fun. I have learned that guys aren’t aliens when they start talking sports. Sports can be cool. Don’t just walk away when the sports talk starts, or when ESPN pops up on the television screen. And, if you want to learn how to open conversations at work, or in any public setting where you want to build relationships (like the corner bar…), learn at least a little bit about sports. Keep yourself up to date by scanning the headlines and watching a little “SportsCenter” . You’ll be surprised what some sports knowledge can do for you, and you may even find yourself liking it!